Lungsal International :: Penning an Empire: A Brief History of D. Leonardt & Co.
Penning an Empire: A Brief History of D. Leonardt & Co. In 1856, Diedrich Leonardt did not know he was the father of an industry overhaul and the premier of a budding empire when he started a small company manufacturing pen nibs out of stainless steel. He realized the need for increased organization of governments, hospitals, and schools, as well as the ever-increasing literacy of the public created in the writing industry. He witnessed two massive expansions of the company - in 1863 and 1867 - before his death in 1881. Most notably, perhaps, he oversaw the invention and introduction of an innovative new type of fountain pen, the Automatic Wonder Pen in 1871. The same year Leonardt died, D. Leonardt & Co. merged with another growing company in the pen trade, Hewitt & Co. The company continued its traditions of innovation and expansion, and eventually merged again in 1949 with the renowned Highley Pen Company, owned by Arthur Charles. At this time, the remaining members of the Leonardt family, namely Diedrich's son Charles, stepped out of the business and were no longer active in the company. In order to combat waning industry conditions in 1990, D. Leonardt & Co. joined a coalition of other companies (Highley Pens, Platignum and Osmiroid among them), and with Highley as the holding company, it changed its name back to the original D. Leonardt & Co., though the new coalition was called Manuscript Pen Company. The company functioned solely through a network of resell and retail distributors until 2013. That is when it launched an online sales platform, which made it possible for consumers to order directly from the company. In addition to the original steel pen nibs for fountain and dip pens, D. Leonardt & Co. makes a number of other products, including calligraphy tips for professionals and beginners. The company began manufacturing decorative metal corners in 1970; these are used in diaries, journals, photo albums, menus and other displays, projects and documents. In 1883, Hezekiah Hewitt of the newly-merged Hewitt & Co. patented the ballpoint pen, which was originally dubbed the Eureka pen. The round tip enabled smoother writing, a more even application of ink and reduced friction and drag while writing, which made writing easier and more accessible. More than 200 million pens were sold each year in the mid- to late-1880s! Currently, the Manuscript Pen Company makes and sells stationery; high-quality leather-bound diaries, journals and portfolios; and pen holders and clips. 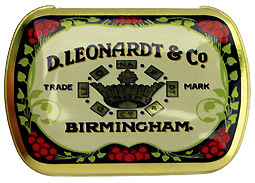 The name and ownership of the company have changed a few times in the 160 years of its operation, but D. Leonardt & Co. has survived to become one of the oldest manufacturers of pen nibs still in operation. Once a favorite of Italian, Spanish and Portuguese royalty, the company still proudly boasts its renowned trademark crown emblem and maintains a reputation as a provider of writing and manuscript tools for writers and artists.